Bridgette Tipton is a 2007 CHS graduate pursuing her Master of Arts in History at University of San Diego while simultaneously being a mother to four during her husband’s deployment. Being a military family, they are familiar with acclimatization and going with the flow. 1. How do you get four boys under the age of eight to school on time? I have six morning alarms set on my phone to make sure we all wake up in time to get to class, yet we are always late at least once a week. I also rely heavily on coffee; usually lukewarm by the time I get to it. 2. Your husband, Phillip, is a Reconnaissance Marine (a CHS graduate, Class of ’97). What helps you get through his deployments and time away from the family? Having a strong support system is instrumental in coordinating our schedules. Lucky for us, my mother lives nearby and watches the kids while I am in school. My father-in-law also helps in taking the boys to games. We also keep plenty busy which helps the time pass by. Whether it be going for a bike ride or making it to soccer practice, our boys are learning resilience and adaptation at an early age. 3. How has the support of your Coronado community helped your family? Our friends here have helped me withstand the time away from my husband. After I gave birth to the most recent addition to our family, Seamus Gray, I had some serious complications. One friend set up a Meal Train for our family so that I did not have to plan meals after Seamus was born. My friends dropped everything to take care of Caleb, Robert, and Finn while I stayed in the hospital, as my husband was on his deployment during the birth. I thought this deployment would teach me how to be strong alone; however, what I am being taught is how to accept help from those around us. I am extremely grateful for the compassion from our neighbors. 4. What do the kids think about their dad being in the military? According to the kids, their dad jumps out of planes and flies through the sky like Ironman, shoots better than a storm trooper, and swims faster than Aquaman. He is their hero and they want to be just like him when they grow up. Though not able to talk to him often due to opposite schedules, we send him packages with the kids’ artwork or email him pictures of their Lego creations. When he is gone, the boys miss wrestling with him, snuggling with him; the way he makes pancakes, and of course, going to get donuts from the Clayton’s window on the weekends. 5. What are you planning on doing when your husband returns from his deployment? The very first thing the boys will want to do is wrestle. Perhaps I can catch a cocktail break while they do so. After Phillip has had down time at home, we want to take a family road trip along the California coastline to show the kids Big Sur and San Francisco for their first time. To say I am looking forward to it would be putting it mildly; we are looking forward to his return. 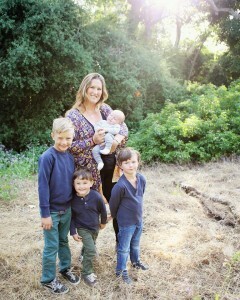 Bridgette Tipton pictured with son Seamus (7 weeks), and L-R: Caleb (age 8), Finn, (age 3) and Robert (age 4). Photo by Allie Gordon Photography.